This is the nicest aftershock and I\'ve only ever known it as \"Red\" aftershock especially since green aftershock disappeared. I couldn\'t drink it in shots though so I usually mix it with cream soda. Definitely not a shooter, or a guzzler, but a definite good sipper. Best cinnamon alcoholic beverage. The original - try this in a test tube, filled a third of the way up, topped with a third of blue aftershock then a third of baileys, mind blowing, but good! I hate this drink. It is a bad excuse for alcohol and the taste is horrible. I seem to be the only person who doesn't like it but I must admit I did enjoy it when I was younger when I hadn't tasted better alcohols. It's amazing taste and the great feeling simply makes you addicted! 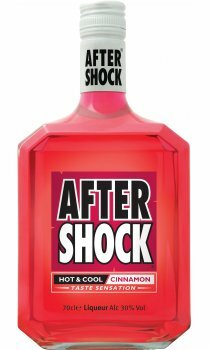 Aftershock "Hot & Cool" (better known as "red") is a delightful fiery cinnamon liqueur. I'm quite a drink snob, really - you'll usually find me drinking wine, cognac and malt whisky - so I was very pleasantly surprised the first time I tried this. It adds a nice kick as a chaser or just on its own. Granted, the main use of this drink is usually for those who want to get "wasted" but it can certainly be drunk responsibly, and it's nowhere near as wild as absinthe or such. While it's certainly not a refined drink, Aftershock Hot & Cool shouldn't automatically be categorised with alcopops and other nasty teenage drinks. Give it a try some time and you'll see what I mean. It's a fantastic shot and I'd have it over most tequila. omg!!! this is the BEST alcohol EVER!! u cant find it in many places here in vegas.. it took me 9 months!! if i were an alcoholic, this would be my drink of choice. it messes u up, n u can feel it goin down. once uve had it, ure addicted! hiya i liv this drink i had 4 of these in one night and was GON GON GON! In my opinion, this is revolting synthetic goop. i love this drink soooooo much its make me feel soooo gooddddddddddd and I can't find it in NY (I use to drink it in Israel). So. buy buy and don't stop drinking it!!!!!!!!!! This drink is pure leathal. It blows ur head in the best way possible!! I only wish I could drink this all the time! !